Our vacation homes are the perfect place to stay for all kinds of outdoor activities. 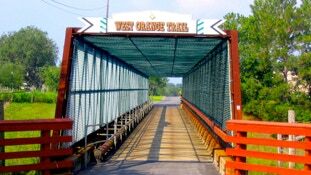 Whether it is golfing, biking, playing tennis, boating, or fishing the weather is perfect year round to get outdoors! 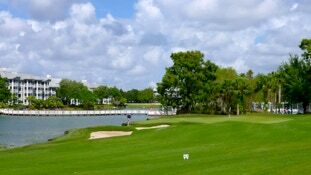 GOLF COURSES: The Orlando area has a history as a golf destination dating back to the 1920’s. Today Orlando has over 150 golf courses and are available for all kinds of skill levels. Our climate means that golf is always in season! Orlando is home to many of the top golf players in the world. Many courses in the area are designed by some of the top names in golf including Arnold Palmer, Tom Watson, Jack Nicklaus, Reese Jones, Greg Norman, tom Fazio, and maybe the most famous golf course architect that you may have never heard of, the great Joe Lee. All these wonderful golf courses are within an easy drive of our vacation homes. All you have to do now is book your tee time! TENNIS: Perfect weather makes Orlando the place to play tennis. Many of the 800 tennis courts in the area are free. 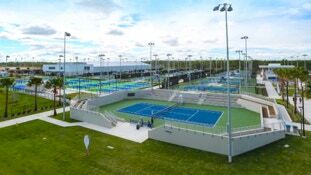 Orlando is also home to the USTA National Campus which features over 100 tennis courts on a campus of over 64 acres! So don’t forget your racquet. LAKES, FISHING, AND BOATING: Fly over the Orlando area and you’ll see that we are home to hundreds of lakes, from tiny lakes in neighborhoods to Lake Toho which covers over 19,000 acres and Lake Kissimmee which covers over 35,000 acres. They say if there is water in the lake in Orlando there will be fish! Just remember that anyone over 16 is required to have a fishing permit in Florida. If you are looking for an organized fishing trip they are available on the Butler Chain of Lakes, Lake Toho, Johns Lake, the Conway Chain of Lakes, Lake Kissimmee, and more. If fishing isn’t your speed there are lots of opportunities to enjoy the lakes, from paddle boarding on Lake Kilarney, to airboat rides, to scenic boat tours in Winter Park and on the Butler Chain of Lakes.